The vast majority of people give access to Collaborate sessions via the Collaborate Scheduler in Blackboard. There is nothing wrong with this and actually there are a number of advantages to do it this way. Once a session has been scheduled the link automatically appears in the schedule no further work is required to give access. Students can easily see a list of the up coming scheduled sessions. Once a recording has been processed it is automatically made available to students. All Collaborate content is accessible in one place so students are in no doubt where to look for the link to their live session or recording. There is however an alternative way to think about how to distribute this content. Instead of having a page of “Collaborate content”, the links to sessions and recordings could be contextualised with other materials. Often courses are arranged by week number and there is no reason that Collaborate content should be treated any differently. Instead of students browsing to a “Collaborate page” they would simply navigate to “Week 1” and access all content related to week 1, be this lecture notes, readings, Collaborate sessions and Collaborate Recordings. This brings with it the obvious benefit of related content being more easily accessible but it is more time consuming as multiple links would need to be added as content becomes available. Fortunately for us there are no technical constraints which stop this from happening as Collaborate provides it’s materials to Blackboard not just as a “tool” (the scheduler) but also as a “content type”. This content is accessible to add to a content area from the scheduler. If you have not added the tool link into the course menu the scheduler can be accessed in a number of ways. The Blackboard Collaborate link under Course Tools in the control panel. 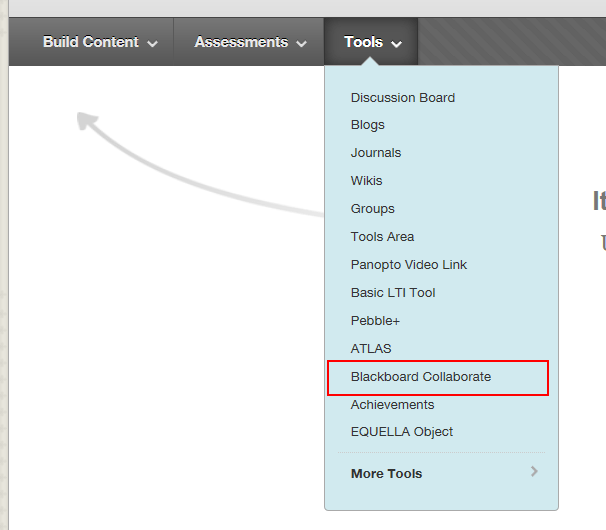 The Blackboard Collaborate link under Tools in the Activity menu available at the top of any content area. Once on the scheduler page you can simply click Add Link which is accessible from the context menu for the session or recording in question or again use the Add Link button which appears under the course or my room boxes. Please see the Linking to a session, room or recording for a step by step guide. An important element of this is to remember that there is no best way just the most suitable way within any given case. It will entirely depend upon the way in which the module is structured, the time resource available and the context in which the module exists in the first place. Indeed consideration to using both means could be given and may be thought of as the “belt and braces” approach.